By 9am I was standing outside the stage door at the Royal Concert Hall in Nottingham where Biba, along with other Dance Activate pupils was taking part in a workshop with the English National Ballet cast of Against Time. If you haven't heard about it, Against Time is an innovative English National Ballet collaboration with the street crew Flawless, that is simply amazing. So our day began with a workshop led by some of the company dancers. Then it was time to meet the guys from Flawless and I have to say that they were exactly that. They signed autographs for all 35 of our children, posed for photos and were just fab. But what about Against Time? It's breathtaking in it's innovation. A simple fusion of modern and traditional styles come together to produce something that's actually so far out of a traditional ballet realm that it should crash and burn, but it doesn't. Instead it results in something spectacular, exciting, thrilling and modern. The whole cast steps up to the mark, the ENB girls get low down and dirty and respect to the Flawless guys for their partnering skills. I really do think that in a show that's going to be seen by a LOT of underage kids then the radio edit of a track with the F word in it really should be used. A small niggle because English National Ballet's collaboration with Flawless really is exactly that... Flawless. For information on Leicestershire Dance Activate classes see here. 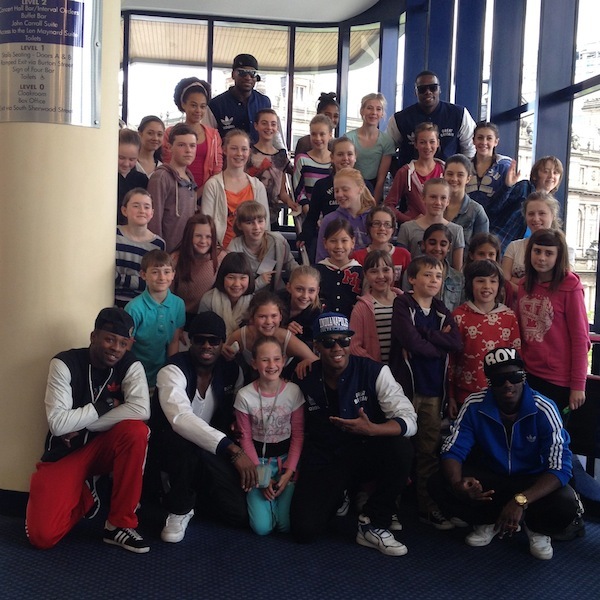 Thanks to @FlawlessUK for giving me a RT on the above pic. It made my day!